This well appointed, clean two bedroom house is located on MARINE TERRACE, just one short block from the ocean, with nice ocean views. Perfect for one or two couples. New outside patio furniture and massage chair to add to your relaxing time in Cambria. No garage access. Wireless Internet access! Owners will accept 2 night stays year round! Please call our office for special offers! 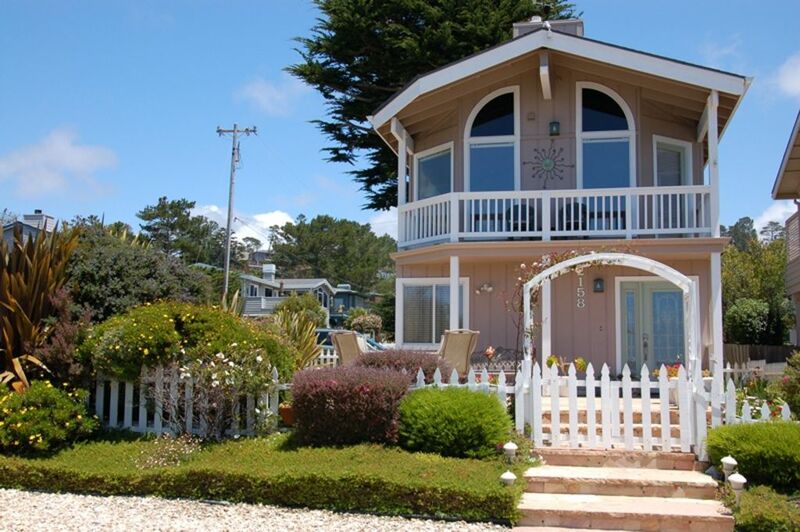 Gorgeous ocean view flagstone patio with jewel inlays, lots of lounging and patio furniture and built in BBQ. Twinkling lights surround the patio. 1 block to beach, beach chairs,beach toys, hair dryer, terry cloth robes, electronic dart board and lots of games, videos, CDs, DVD's available for guest use. Wonderful house, nice views, great yard for your dogs. Our stay was lovely, the house is very nice. Kitchen was great with everything we needed to cook. Beds were very comfortable. Only one negative couch and chair upstairs very hard and not comfortable. We had some ants and TV was a little hard to figure out, they need better instructions for the TV. Other than that it was a great stay and would rent again if they had more comfortable furniture upstairs. We truly enjoyed this lovely home and will definitely return in the future. The massage chair is awesome and it felt so good to sit in it in front of a warm fire and have relax time with a glass of wine. I stayed here over Thanksgiving with my 4 children. Downstairs has the bedrooms (2) and a little mostly finished garage with a couch. Beds are on the smaller side if you need space for people to sleep. There is also a couch upstairs in the family room. The couches made it possible for us to sleep comfortably. Upstairs has a family room, kitchen and full bath. It opens up to a balcony that has a beautiful partial view of the ocean. Very clean home with a double oven. There is no garage if that matters to anyone. Outdoor ground floor patio is very nice. Easy to check out. Location is amazing just a block from the ocean. If you enjoy walking/running, the house is a few blocks from Fiscalini Ranch. We would stay again for sure! Thank you for letting us use your beautiful home. The home was clean and comfortable. The DVD player was broken. I called the office about it and never received a call back. Views were great from the living room. Place was clean and well equiped. Very well decorated. Yard is nicely fenced for pets. A few disappointments, bbq didn't work and no screens on any windows (couldn't have windows open at night to listen to the ocean sounds as well as it was stuffy in the house without being able to keep windows open, no ceiling fans). Our goldens love the patio. We liked the vacation rental there was only a couple of things that needed to be replaced. The beds were so hard. And the couch was dirty and needed to be replaced. We did not sit on it for that reason. Elephant Seals, Hearst Castle, Wineries, Lawn Bowling,Dog Park, Skateboard Park, Children's Playground, Park and Swimming Pool Overlooking the Ocean, Bluff Walk Overlooking the Pacific Ocean, Boardwalk Along the Ocean, Art Galleries, Antique Stores, Award-Winning Restaurants, 2 Performing Art Theaters, and Many Music Venues. Regular Special: Stay 4 nights get the 5 night FREE! Summer/Holiday Special: Stay 6 nights get the 7 FREE! Enjoy a FREE bottle of excellent local wine with your stay!